Swissvoice ePure Bluetooth station - BH01i model. Swiss-based telecom and peripherals vendor, Swissvoice, has entered the Australian market with the local launch of its ePure range. ePure promises high-quality audio and ergonomic design through its home phone and mobile products which include the ePure Bluetooth station, ePure corded mobile handset, and ePure Dect cordless home phone. Swissvoice states that all ePure devices use Fulleco technology, which lowers the body’s exposure to electromagnetic emissions by 65 per cent. The ePure Blueooth station, available in BH01i and BH01u models, connects a smartphone, tablet or PC via Bluetooth 2.0. The device’s wireless handset can be removed from the body of the unit and used like a regular cordless or speaker phone. Phone calls aside, the station’s speakers can be used to listen to music. 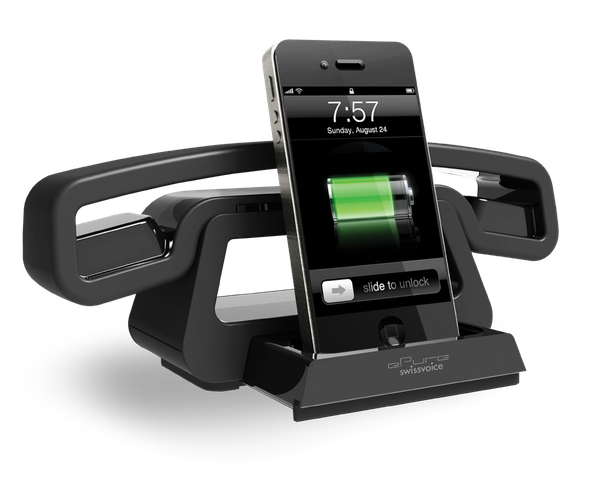 The BH01i version features an Apple-style 30-pin adapter dock on which an iPhone or iPod can be mounted. The BH01u caters for users of other devices, housing a USB charging port instead. The models are priced at $159 and $149, respectively. Swissvoice’s ePure corded mobile handset plugs directly into a smartphone or tablet for an ‘at office’ feel. The single model features a universal mode for compatibility with any device, or ‘Made for iPhone’ mode which enables it to control an iPhone’s volume, launch Siri, and receive calls. The simple peripheral is priced at $49. The ePure Dect cordless home phone is exactly what the name suggests, although, according to the vendor, “the handset’s large acoustic chamber and speakers optimise sound volume and clarity.” Essentially, the Dect turns a boring home phone into something more modern and entertaining for $99. ePure products are available from Myer, Harvey Norman, David Jones, and JB Hi-Fi.